The virus under study, herpes simplex virus type 1 (HSV-1), usually causes nothing more severe than cold sores around the mouth, says Curtis Brandt, a professor of medical microbiology and ophthalmology at the University of Wisconsin-Madison. Brandt is senior author of the study, now online in the journal PLOS ONE. When Brandt and co-authors Aaron Kolb and Cécile Ané compared 31 strains of HSV-1 collected in North America, Europe, Africa and Asia, "the result was fairly stunning," says Brandt. "What we found follows exactly what the anthropologists have told us, and the molecular geneticists who have analyzed the human genome have told us, about where humans originated and how they spread across the planet." Geneticists explore how organisms are related by studying changes in the sequence of bases, or "letters" on their genes. From knowledge of how quickly a particular genome changes, they can construct a "family tree" that shows when particular variants had their last common ancestor. Scientists have previously studied herpes simplex virus type 1 by looking at a single gene, or a small cluster of genes, but Brandt notes that this approach can be misleading. "Scientists have come to realize that the relationships you get back from a single gene, or a small set of genes, are not very accurate." The PLOS ONE study used high-capacity genetic sequencing and advanced bioinformatics to analyze the massive amount of data from the 31 genomes. The technology of simultaneously comparing the entire genomes of related viruses could also be useful in exploring why certain strains of a virus are so much more lethal than others. In a tiny percentage of cases, for example, HSV-1 can cause a deadly brain infection, Brandt notes. "We'd like to understand why these few viruses are so dangerous, when the predominant course of herpes is so mild. We believe that a difference in the gene sequence is determining the outcome, and we are interested in sorting this out," he says. For studies of influenza virus in particular, Brandt says, "people are trying to come up with virulence markers that will enable us to predict what a particular strain of virus will do." The researchers broke the HSV-1 genome into 26 pieces, made family trees for each piece and then combined each of the trees into one network tree of the whole genome, Brandt says. "Cécile Ané did a great job in coming up with a new way to look at these trees, and identifying the most probable grouping." It was this grouping that paralleled existing analyses of human migration. The new analysis could even detect some intricacies of migration. Every HSV-1 sample from the United States except one matched the European strains, but one strain that was isolated in Texas looked Asian. "How did we get an Asian-related virus in Texas?" Kolb asks. Either the sample had come from someone who had travelled from the Far East, or it came from a native American whose ancestors had crossed the "land bridge" across the Bering Strait roughly 15,000 years ago. Herpes simplex virus type 1 was an ideal virus for the study because it is easy to collect, usually not lethal, and able to form lifelong latent infections. Because HSV-1 is spread by close contact, kissing or saliva, it tends to run in families. "You can think of this as a kind of external genome," Brandt says. But what really jumped out of the study, Brandt says, "was clear support for the out-of-Africa hypothesis. Our results clearly support the anthropological data, and other genetic data, that explain how humans came from Africa into the Middle East and started to spread from there." The correspondence with anthropology even extends, as before, to the details. 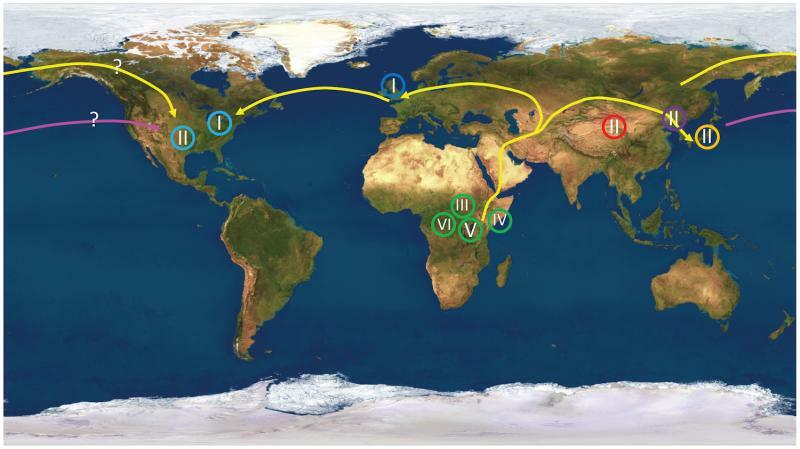 In the virus, as in human genomes, a small human population entered the Middle East from Africa. "There is a population bottleneck between Africa and the rest of the world; very few people were involved in the initial migration from Africa," Brandt says. "When you look at the phylogenetic tree from the virus, it's exactly the same as what the anthropologists have told us."